Equality: Healthy relationships include an equal give and take. If you feel that you are giving the other person more attention than they give to you, or you feel pressured to spend a certain amount of time with them, this may be a sign that your relationship is unhealthy. Safety: You should feel safe in your relationship. You should never feel pressured to do something you don’t want to do and you should never feel uncomfortable saying “no.” This includes online relationships too. For example: you should never feel pressured to give anyone your social media passwords or email pictures you don’t want to share. If a partner forces you to do something you don’t want to do, it is important to tell a trusted adult. Trust: In a healthy relationship, you should be able to trust your partner and it is equally important to be honest with one another. This means being able to speak freely with them, knowing they will keep your secrets, as well as knowing they will be true to you. Happiness: Romantic relationships should be fun! Being in a healthy relationship should make you feel good about yourself especially when you are with your partner. 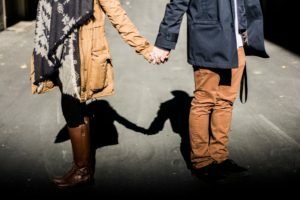 Feeling sad, scared, or nervous with your partner may be signs that you are in an unhealthy relationship. If you feel sad or anxious more often than you are feeling happy or enjoying your time together, it’s important to talk with your partner about your feelings. If you feel you can’t talk to your partner, tell a trusted adult. Every relationship is going to be different and some relationships are better than others. Starting a new relationship can be scary at first but can also be an exciting time. It’s important to remember that in every relationship, romantic or otherwise, honest communication with respect and trust for one another is essential for success and happiness. If you are concerned about your safety and need help getting out of a dangerous relationship, there are resources available to you (see below for a few). It is often very helpful to talk with a friend or someone you trust. If you have specific concerns about your safety, it is important to reach out to a trusted adult. This is also important if you are worried about a friend’s relationship. If you notice signs that your friend may be in an unhealthy relationship, you can help them by telling a trusted adult about your concerns. Remember if you are ever worried about your (or a friend’s) immediate safety, you can always call 911.